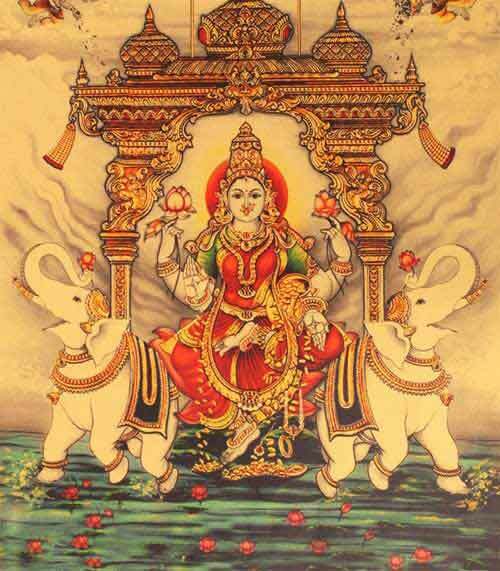 Gaja Lakshmi form of Goddess Lakshmi is worshipped for attaining wealth and prosperity. There is a popular belief that chanting the mantra for 16 days will help in alleviating poverty. This Gaja Lakshmi mantra should be chanted for 16 days in the morning and evening. The mantra should be chanted for 16 days. House should be kept neat and clean. All junks should be removed from the house. A painting or photo of Gaja Lakshmi should be installed in the puja room. On one of the 16-days, you should donate food - perform Annadanam. A sapling of a fruit bearing tree should be planted and taken care of. During any four days of the 16-day chanting, prasad using wheat should be prepared. Goddess Lakshmi Food Offering - Which Food Should Be Offered to Goddess Lakshmi as Bhog or Prasad?